(Notes on) Politics, Theory & Photography: Plagiarism? sell for as much as $25,000, and Burdeny's for up to $10,500. could adversely affect those values." Well, there has been a bit of a dust up in the past week or so about photographers (allegedly) copying photographers. You can find one news report here, an earlier one here. I offer the two images I've lifted above as a suggestion that just maybe this fracas is more than a bit overblown. And, of course, I've posted repeatedly on Geoff Dyer's The Ongoing Moment the primary theme of which is the ways that photographers replicate each other's images. In those posts, as well as in Dyer's book, you can find more examples. Of course, we worry way more about the implications of "confusion" for markets here than we did in say, thinking about credit default swaps and such totally opaque financial instruments. P.S. : The opening quotation is from the LA Times news report to which I link in the post. I think these things get pretty overblown sometimes. 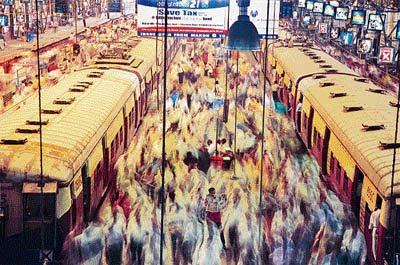 Does Salgado have a copyright on the train station itself? Hardly, IMO. But maybe I am ignorant of the LAW. Sure, the photographs look similar, and are taken from a similar vantage point. So what? This reminds me of photographers who take a picture of a mountain and then slap a copyright on the image--as if they had anything to do with creating the mountain. Photography takes skill, sure, but it's also something that is easily imitated and copied--it's not all that hard to go to Yosemite and take a photo that reads a little like an Ansel Adams. Photography is an art that's all about representation and reference, and there is a long history of imitation and mutual influence. Hell, all art is highly referential and imitative. The problems only crop up when people start talking about marketing work and trying to control who owns what. Sometimes this whole copyright issue get a little ridiculous. In the end, I think both of the photographs you posted are pretty interesting. While they are obviously related in concept (I assume), I do not think that one person has a legal claim to a particular view of a public place. 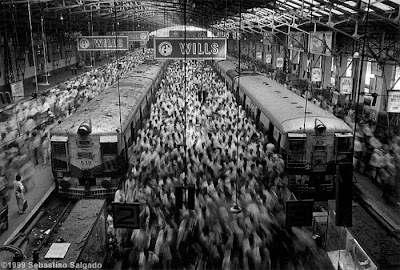 Salgado has a copyright to his negative, not to the actual subject, vantage point, or place, IMO. If someone can take a Leica and make a pretty close approximation to what Salgado did, should that be illegal? Communications from the "bizzaro universe" . . .
Evans & Lange & Rothstein & Shahn, Oh My!